Mix graham crumbs and butter until blended; press onto bottoms of 18 paper-lined muffin pan cups. Beat cream cheese, sugar and vanilla with mixer until blended. Add eggs, 1 at a time, mixing on low speed after each just until blended. Spoon over crusts. Bake 15 to 20 min. or until centers are almost set. Cool completely. Refrigerate 2 hours. Beat whipping cream in small bowl with mixer on high speed until stiff peaks form; spread onto cheesecakes. Top with blueberries and zest. Omit the whipping cream, blueberries and lemon zest. 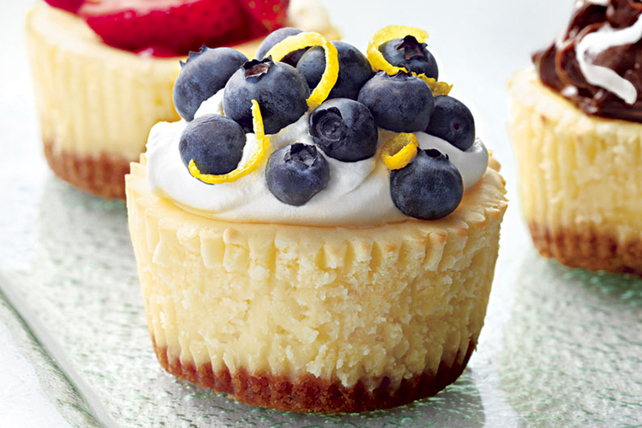 Bake and refrigerate cheesecakes as directed. Spread evenly with 1/3 cup strawberry jam. Garnish with fresh strawberry halves and mint sprigs.